Contains Type 2B Parvovirus for rapid immunity and cross protection against all recognized field strains. High titer, low passage parvo fraction - High vaccine titers have been shown to overcome low-level maternal antibody interference in puppies. Meets or exceeds all USDA Standards. Convenient choice of IM or SC administration. Ideal first shot for puppies - No Lepto fractions. Dosage: The dosage is 1 mL injected intramuscularly or subcutaneously. Open syringe by twisting or tapping the cap against a hard surface to break the heat weld. Prepare the vaccine by injecting the diluent into the vial containing the desiccated vaccine cake. Shake well. Withdraw entire contents into the syringe. Thoroughly prepare injection site with antiseptic. Subcutaneous administration: Lift the loose skin behind the neck or behind front leg and insert needle. Inject entire contents of syringe. Do not inject directly into blood vessel (see note below). Intramuscular administration: Insert needle into muscle of the hind limb (see illustration). Inject entire contents of syringe. Do not inject directly into blood vessel. IMPORTANT NOTE: Before injecting vaccine pull back slightly on syringe plunger. If blood enters the syringe freely, choose another injection site. For puppies 9 weeks or younger vaccinate healthy puppies at 3-4 week intervals until 16 weeks of age for at least 3 doses. 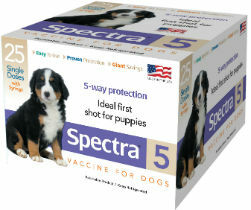 For puppies over 9 weeks and adults give a minimum of 2 doses at 3-4 week intervals. Annual revaccination with a single dose is recommended. Do not vaccinate pregnant animals. Do not use in ferrets or mink. Protective immunity may not be completely established in all puppies vaccinated at less than 16 weeks of age because of maternal antibody interference. Only vaccinate healthy animals. Animals incubating any disease or stressed due to shipping, malnutrition, or parasitism may not achieve or maintain an adequate immune response. Burn containers and unused contents. Although rare, severe allergic reactions (anaphylactoid) may occur that require immediate veterinary care.